Snow Owl supports the creation of local code systems (LCS). The local code system view allows you to create new local code systems where each root node represents a separate local code system to group the local codes under. From the navigator you can add a new local code system or code to the hierarchy via an associated editor where you can specify additional properties. These local codes can later be referenced in value domains and mappings. 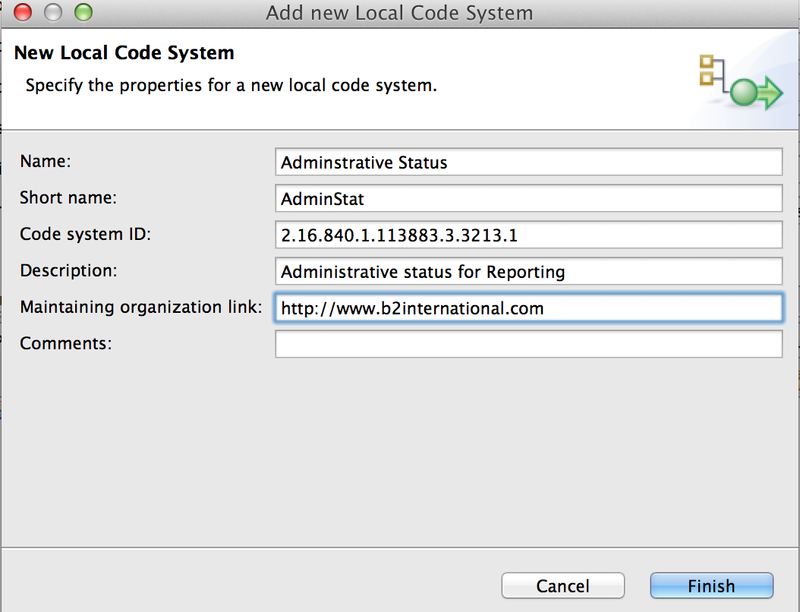 To''' create a new local code system' , click on the link in the code system view, or use the ''Add a new local code system button in the toolbar. Specify the properties for your local code system. Name, Short name, Code system ID, and Description are mandatory. Short name: Enter a short name or abbreviation for the code system, this will be used in the navigator. Comments: You can enter additional information here. Click Finish proceed, you can also add a commit comment. 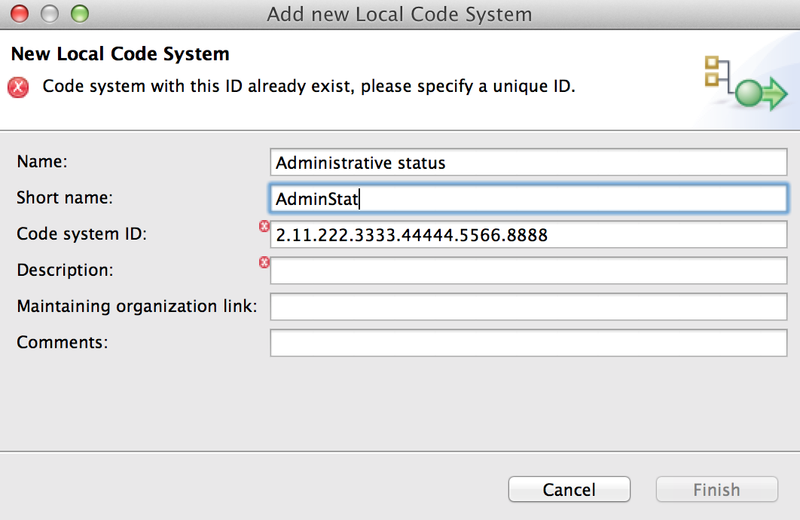 The new code system is now displayed in the local code system view where you can add codes to it. 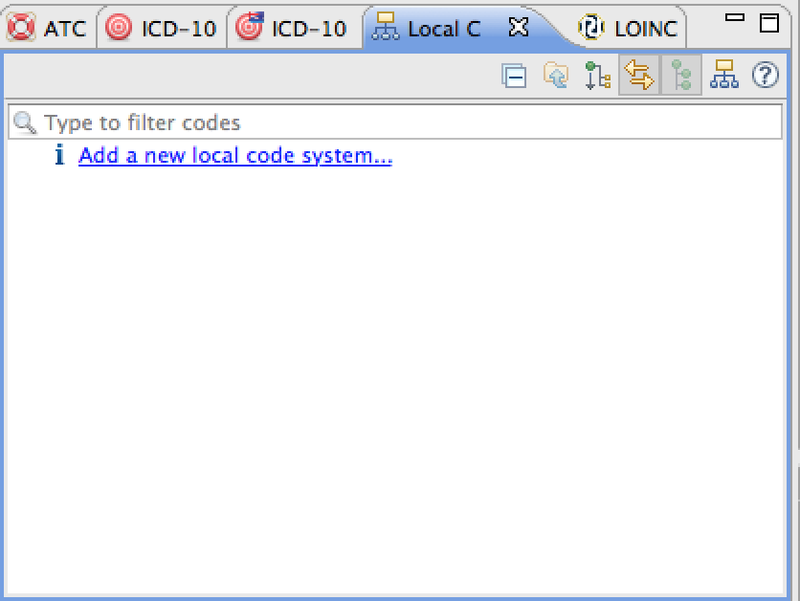 To create another local code system, use the respective button in the toolbar. 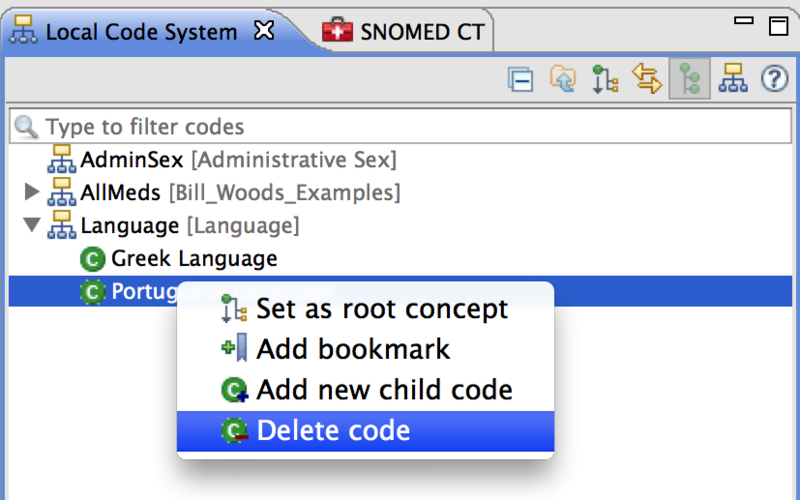 All created local code systems will be registered in Snow Owl's terminology registry. To''' delete a local code system''' right-click on the code system and select Delete local code system from the context menu. You will be presented with a deletion plan that shows all the codes that are affected, hit Finish to confirm the deletion. Note: The deletion of local code systems or codes is not allowed if they are referenced in value domains or mapping sets. 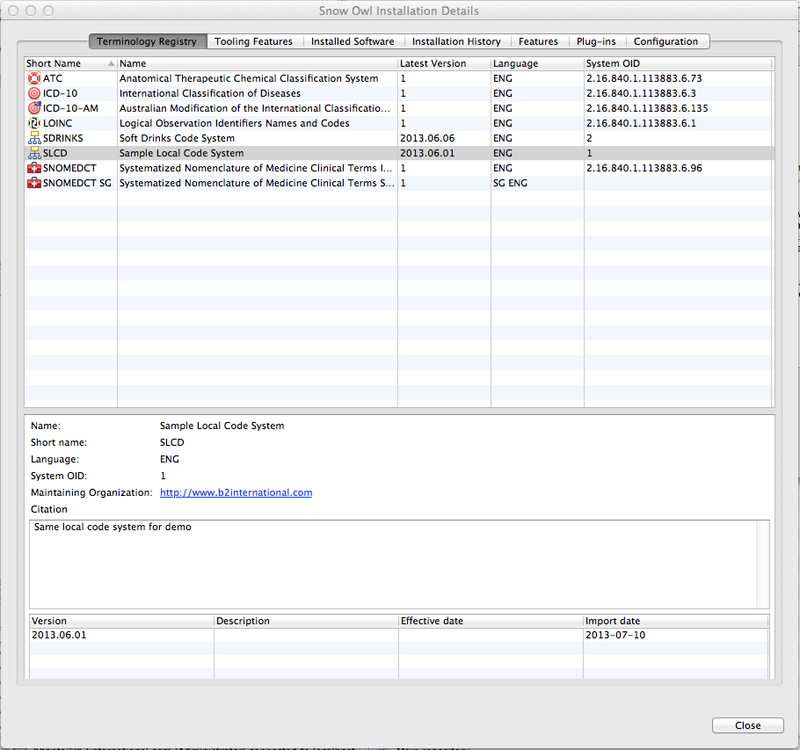 The dialog shows where the code is referenced. Make sure you remove all references, then start the deletion again. To add a code to your local code system, right-click on the name to bring up the context menu, and select Add new child code. Enter the code ID and the code term. If you want to specify alternative terms, click on the Add new term button and enter the information. If you can't see the entry field, click on the triangle to open the section for alternative terms. To delete an alternative term or if you unintentionally added an entry field click on the minus button next to the entry field. 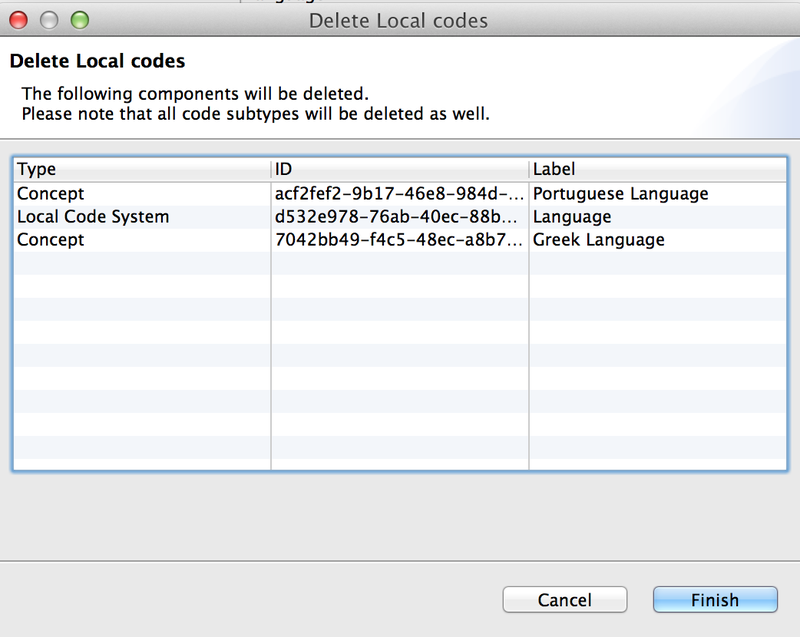 After saving the new code is displayed in the local code system view. 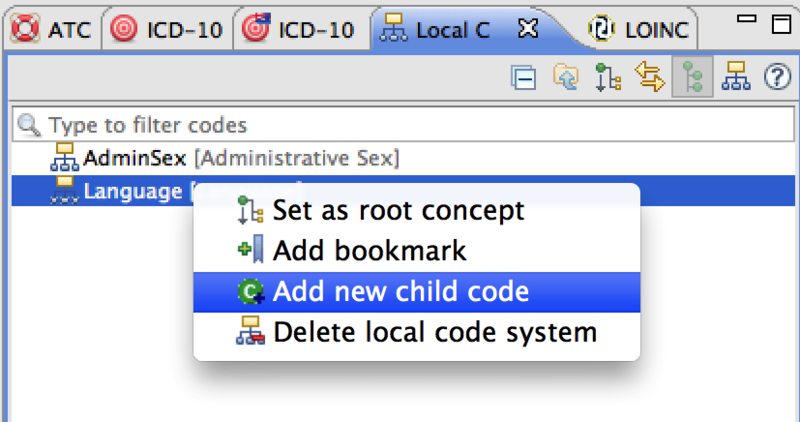 To add a code of the same hierarchy level as your new code, right-click the root (in this case the folder of the LCS). To add a code of a lower hierarchy level, right click on the parent and select Add a child code. Double-click the code in the local code system view to open the editor. Modify the information by overwriting the text fields, or adding or deleting additional terms. Uncheck the box to set the status to inactive. Make sure you save your modifications. Codes can be deleted directly in the view by right-clicking and selecting Delete code. Please keep in mind that the deletion of local code system or code is not allowed if they are referenced in value domains or mapping sets. You need to remove the references before you can execute the deletion. The following validation rules are enforced when creating a local code system. Hovering over the red x icon reveals more information about the error. Name, Short name, Code system ID, Description fields are mandatory.